So now we feel more relaxed & look like we fit in! Yesterday we had our Sydney clothes on, fresh from a cold morning when we left home. Today it’s cosies, boardies & thongs. It’s a very comfortable place when you are dressed in the right clothes! We had a pretty good sleep but 3 little kids thought it was play time in the middle of the night because “we are in a hotel Mummy” – so they think they don’t have to sleep. Luckily the main bedroom has a bed so big that we can all fit in there. 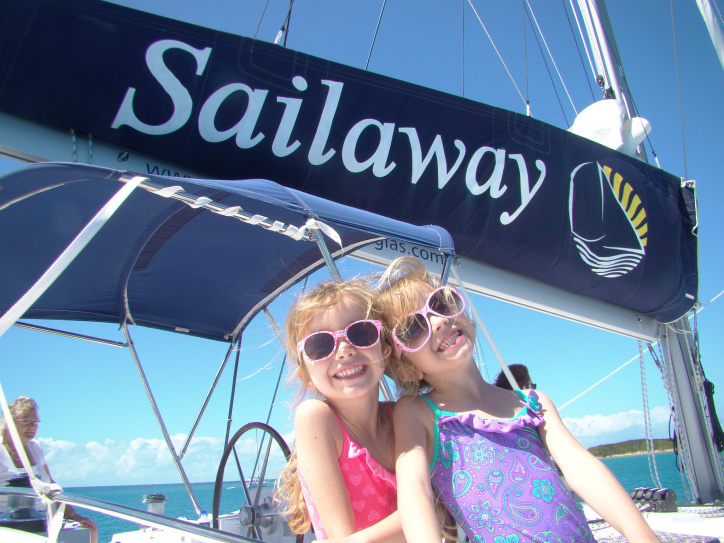 Today was a brilliant day – we went sailing with Sailaway Port Douglas. What a fantastic company. The tour we did was the Full Day Sailing & Snorkelling. Highly recommended, even with kids our age. We were picked up at Reception by the Sailaway driver & taken to the Marina. He was nice & chatty for the quick drive there. We were greeted at the boat by the very lovely Loren who helped us all on board. She introduced us to Courtney & also Sid the Captain, who were also so lovely. They are absolutely fantastic & helpful with the kids, they remembered their names the whole day & offered to mind them if both Geoff & I wanted to snorkel together. We sailed about an hour to get to the Low Isles, a stunning island just like on a postcard. The ride over was relaxing & a great way to spend a Winters Day. Loren, who’s a Marine Biologist, gives you a complete rundown of everything you need to know when we arrive at the island. There’s a beginners & more advanced guided snorkelling tour to take, and with only a max of approx. 30 on board, neither group is too crowded. There are the pool noodles there to use so it’s an easy swim & you don’t hurt yourself or touch the coral. Or just do as you please – no pressure. The island is only small, only about a 10 min walk around & there’s a lot of coral only ankle deep if your kids are too young to swim/snorkel. There’s a lighthouse & pathways around it so its an easy walk for all ages. I went on the advanced snorkel tour with Loren & she’s safety conscious about her group, always making sure she has everyone accounted for. You can stay out longer if you feel like it & explore some more if you’re not ready to go in. (A good tip is to hire their wetsuits – only $5 – it takes the chill out the water if you feel the cold like me.) She let’s you know everything about what you are seeing & what to look for. We spotted some fish – big & small, obviously a lot of pretty coral, a turtle & even some reef sharks (those were from the boat thank goodness). I had an underwater camera hired so I got some cool photos of life in the ocean & I’ll hopefully be able to put them up when the company downloads them onto a CD for me on Saturday. The kids could not even believe they saw sharks in the ocean, not the aquarium and it will be a topic for the girls news day at school without doubt. The food is all included in the tour and after the morning on the island it was back on the boat (via glass bottom boat) for a yummy lunch & the chance to either relax, snorkel from the boat in other deeper areas or go on a glass bottom boat tour. This time Geoff snorkelled & thought it very “interesting” swimming in open water where we had just spotted a bunch of sharks! I took the kids on the boat so we could watch Daddy stay safe. Sid was our guide for this & he pointed out every bit of coral & is really encouraging & great with kids. After the afternoon activities it’s unfortunately time to head back to the Marina. It was a little windy & choppy but that made it fun seeing everyone get splashed at the front of the boat. 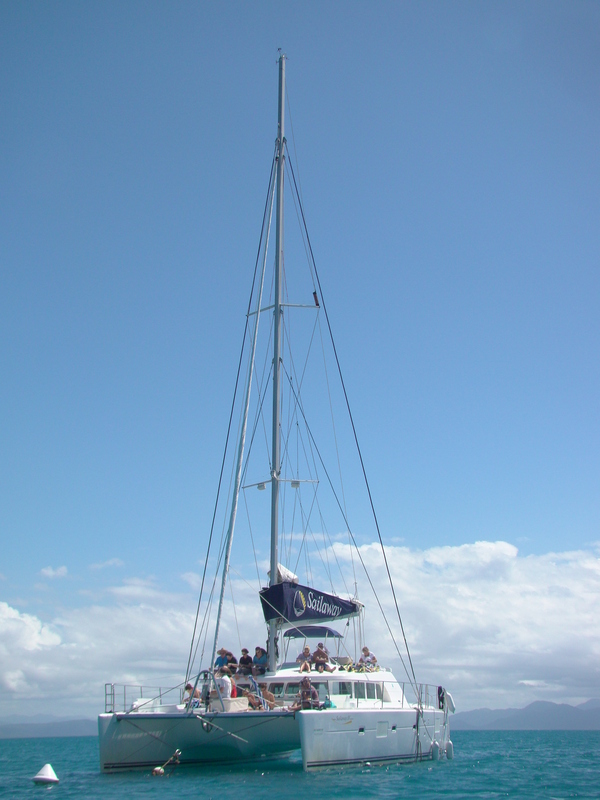 There’s plenty of room for everyone on board to laze around & enjoy the beauty of the ocean. The driver was waiting for us when we arrived & it was back to our gorgeous resort. The friendly cockatoo that was sitting quietly at Reception when we left was still there to welcome us back. What a treat it is to be staying here & walk back into our room. We thought the kids would be exhausted but nooooo, they were ready for a swim in the pool so they had fun splashing around again. There were more people today just relaxing, having a drink, playing cards or reading. Just having fun on a warm afternoon. After a swim we had dinner in the restaurant, which is set out so each table has a view over the pool & isn’t squashed together. Friday nights there’s an all you can eat BBQ which we tried. The kids were tired by that stage & really only wanted the delicious desserts on offer but had fun with the activity bag they got to play with. The staff were really efficient & so very friendly, which of course you get from Worldmark staff. Tonight we’ll all sleep well & will be ready for tomorrow’s adventure of seeing crocodiles!